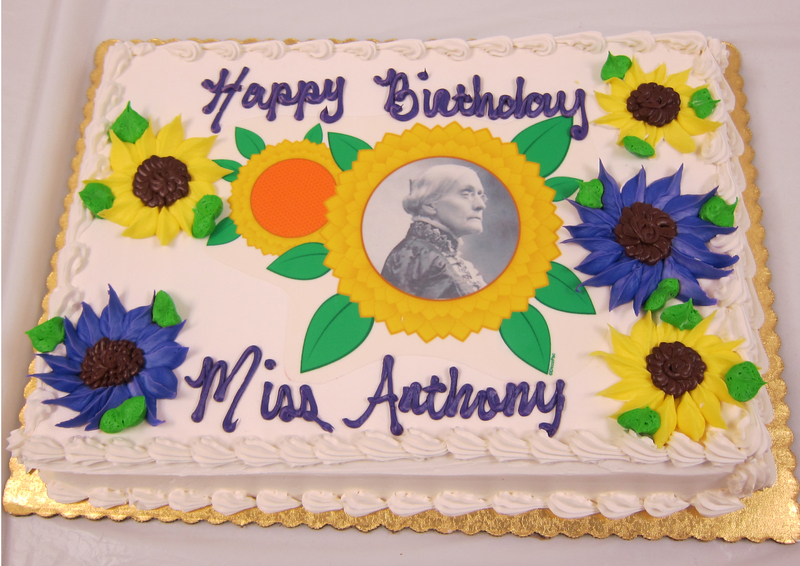 Last Wednesday we celebrated the 192nd birthday of Susan B. Anthony, the nineteenth-century suffragist who, among many of her accomplishments, led a successful campaign to have women admitted to the University of Rochester in 1900. How do you celebrate such a heroic and important figure? To us the answer was obvious: reflection on the past, a focus on the future, and birthday cake for all! Dean Borasi with roses for Anthony. Photo by SBAI. 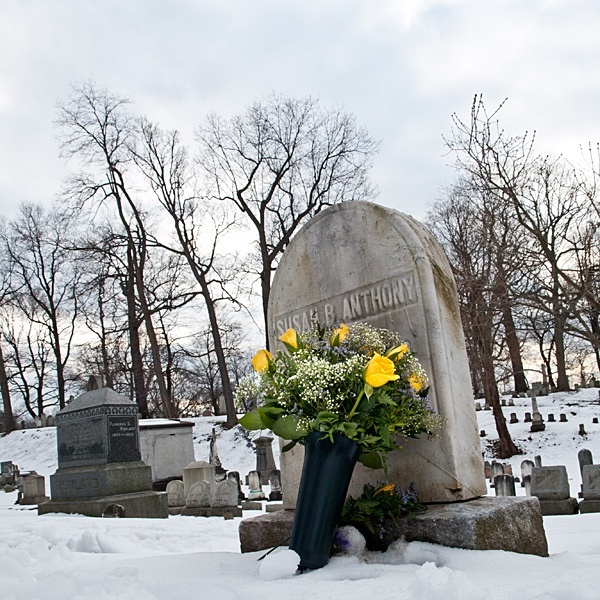 The celebration began with a visit to Anthony’s gravesite in Mount Hope Cemetery. We were honored to have Raffaella Borasi, Dean of the Warner School of Education, join us. Faculty, staff, and students from across River Campus and the Medical Center came along as well to celebrate the life and legacy of Anthony. Dean Borasi placed yellow roses, the symbol of the suffragists, on Anthony’s grave and shared a few words about Anthony’s, giving thanks to her on behalf of all of us for a lifetime devoted to promoting women’s rights and equality. 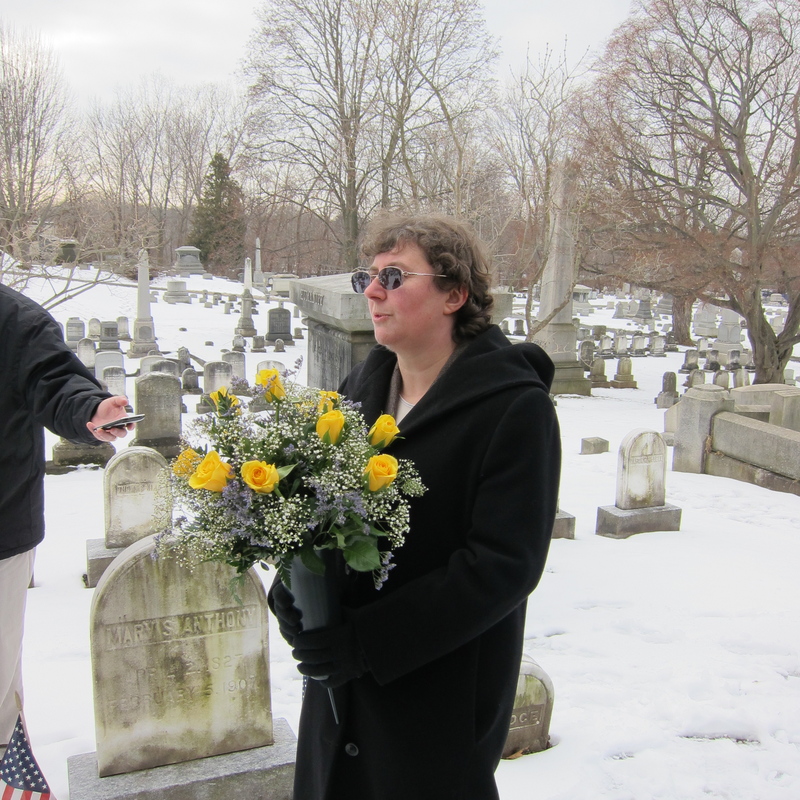 Also joining us at the gravesite were YNN Rochester and the Democrat and Chronicle. Some of the crew at Anthony's grave. Photo by Adam Fenster/UR. While at the gravesite, we were pleasantly surprised to run into Barbara Blaisdell, a Brighton resident who makes public appearances portraying Anthony. Blaisdell, who was still dressed as Anthony from her attendance at the Susan B. Anthony House luncheon earlier in the day, told us that she pays a visit to the grave every year on Anthony’s birthday. Enjoying cake in our classroom! Photo by SBAI. 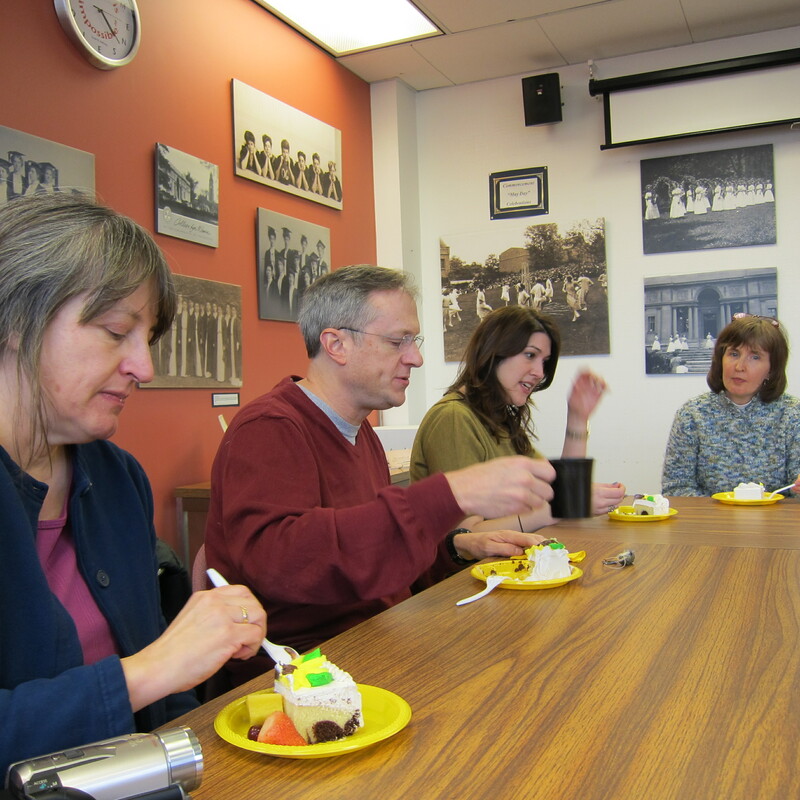 After the gravesite visit our group reconvened in Lattimore Hall to enjoy cake and tea. The Rare Books Library delighted us by sharing memorabilia from Anthony’s life, including copies of letters written by Anthony and photographs of political pins. We look forward to making this event an annual tradition, and hope you can join us next year for Anthony’s 193rd birthday! Couldn’t come? Check out the video on youtube. This entry was posted in Community, SBAI Events and tagged #birthday, #Failure is Impossible, #SBAI, #SusanBAnthony, #warner. Bookmark the permalink.